Walker mowers have long been renowned for their quality and productivity. If this wasn’t enough, here are 10 reasons why you need a Walker next time you need to upgrade your mowing equipment. The compact size of the Walker mower, matched with the unique and responsive steering system makes it easy to manoeuvre between tight places and challenges that different properties will present. No need for bulky attachments or hoses, due to the in-built catching system (GHS). The tilt-up body and deck allows for easy access and maintenance, completely exposing the drive train. Uphold your reputation. The Walker leaves behind a prestige finish and a stripe that is achieved naturally, without the use of a roller wheel. The low, centred seat position of the operator combined with the forward positioning of the deck provides a clear view of any obstacles e.g. sprinkler heads, providing the safest possible way of operation. Grass Handling System – Renowned for its Grass Catching System (GHS), the Walker will ensure your properties will remain neat and clear, with its ability to collect litter and leaves. With a machine weight substantially less than competitive mowers, the Walker will mow with less turf compaction and without flattening the grass, thus protecting the ground surface and those beautiful lawns. Avoid scalping the grounds thanks to Walker’s flexible deck suspension with counterweight springs, which allow the deck to follow the natural contours of the ground and maintain an even finish. Mow your customers properties with minimal disruption. Agility, speed and unique design are all features that combine to give you back your time! Spend less time trimming and enjoy overall increased productivity. The Walker line of equipment is like no other. With five riding models, nine engine choices, 16 decks and many accessories such as de-thatchers, boom sprayers and aerators, the Walker can be configured specifically to your needs and your customers specifications. 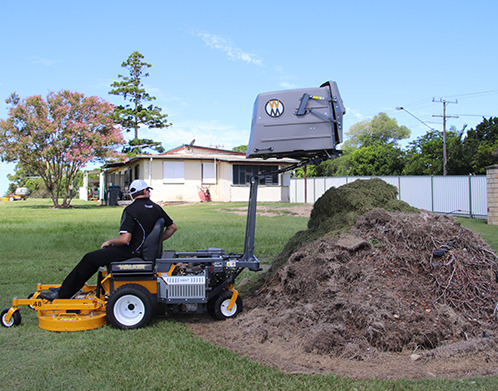 All Walker Mowers are backed by our Australia wide service network. Find your nearest Walker mower retailer here.